Plantation House is a beautiful home situated on the luxurious Bajan west coast. Surrounded by towering palm trees and with an excellently maintained lawn. Plantation House is a beautiful home situated on the luxurious Bajan west coast. Surrounded by towering palm trees and with an excellently maintained lawn, Plantation House is any nature lover's paradise. The home boasts a private outdoor pool equipped with Roman steps for easy access. You'll be able to enjoy the pool's glistening waters at any time of the day or night, with a small seating area poolside for drying off. The large pool area also comes equipped with sun loungers and umbrellas – you'll probably spend most of your days here taking in the tranquil ambience. Flowering plants make for splendid views that can be enjoyed from anywhere in the garden. Looking out over your surroundings, you will feel as if the trees and plants go on forever. Inside, Plantation House benefits from an artistic and luxurious design. When you step foot indoors, you will be greeted by a striking open-air lobby decorated with grandiose ornaments and leading to an elegant open plan staircase. The living room sits adjacent to the dining room. The living room is decorated in charming shades of blue and white and the dining room boasts a high ceiling which holds an elegant chandelier. The dining room is duplicated on the outdoor patio which holds a similar chandelier-lit dining area. When it comes to enjoying dinner with friends, you'll be spoilt for choice. Guests at Plantation House will be treated exceptionally well. A house manager is always on call to help you with any queries that you may have. Whether it's arranging day trips or stocking up on essentials, they will have you covered. 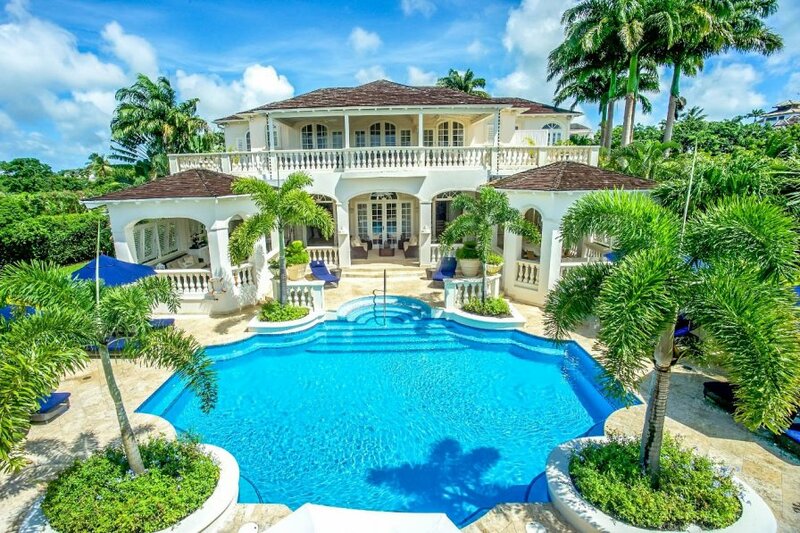 Plantation House is a luxurious 6-bedroom Villa (with additional bedrooms) located in the heart of the exclusive Royal Westmoreland Golf and Country Club. This grand, colonial styled villa offers magnificent views of the Resort and the Caribbean Sea beyond. Plantation House is situated on the exclusive Royal Westmoreland Golf Resort. Your complimentary resort membership includes access to a spa, gym, beach club, restaurant and more. When you wish to venture out, Paradise Beach at only a 20-minute drive away is a stellar choice. This white sandy beach boasts sparklingly clear water and a calming ambience with very little tourists around. Here, you can peacefully gaze of the brilliant west coast of Barbados. Prepare some snacks and head down to this extremely private beach. Flower Forest Botanical Gardens will take you on a journey into a natural paradise. Driving is a wonderful way to see the island, and the botanical gardens are only a 20-minute drive away from Plantation House. Before exploring the gardens, it's worth looking over the brilliant views over Scotland District of Barbados in the Parish of St Andrew. The garden itself will take your breath away, allowing you to completely forget the stresses of everyday life. The gardens are bursting with life at every nook and cranny. Exotic and bright trees, plants and flowers are waiting to be discovered. Plants are labelled and described by an expert tour guide who will lead you along the paths that go through the garden. You will be able to unwind and take in the spectacular scenery on one of the benches placed in a quiet spot. Don't forget your camera – you'll want to keep these epic memories forever!